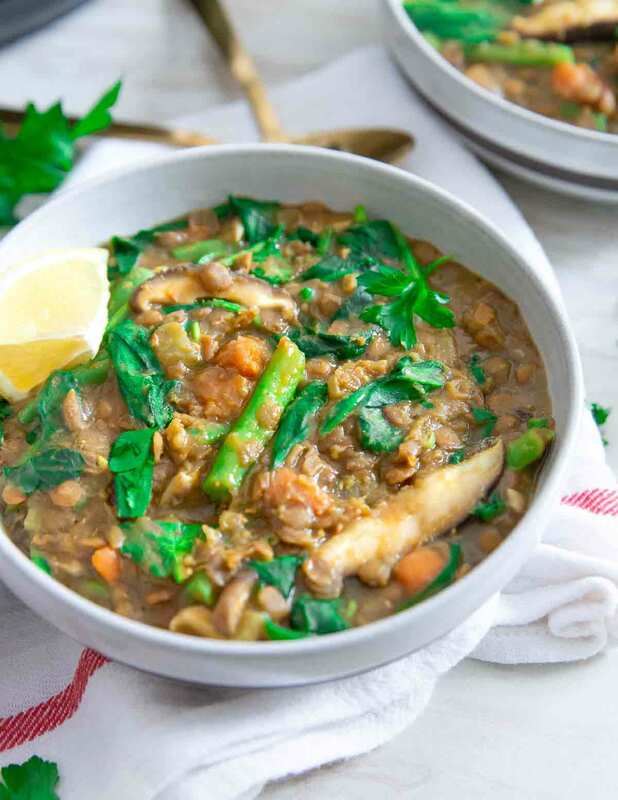 This lentil vegetable soup is packed with mushrooms, green beans and spinach, made entirely in the Instant Pot for a quick and easy comforting vegetarian meal full of flavor. I feel like I hit a turning point with lentils this year. They were never really a go-to ingredient for me mostly due to the fact that my Greek father-in-law has a pot of lentil soup on the stove 24/7 and his house smells absolutely foul because of it. But then I made these chocolate lentil bars as a meal prep recipe one week and also started using red lentils (red lentils cook super fast) in impromptu soup dinners and realized it’s a pretty versatile healthy ingredient I should use more often. Which brings us to this easy lentil vegetable soup recipe. What’s In Lentil Vegetable Soup? 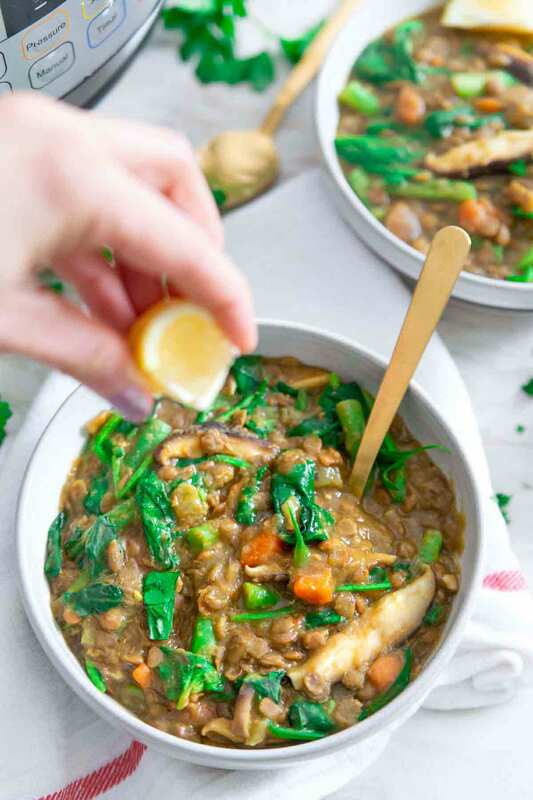 This lentil soup is packed with vegetables and while it’s a vegetarian and vegan recipe, it’s hearty and super filling too. Besides the carrots, celery and onions for the soup base, there are green beans, mushrooms and spinach in this lentil soup as well. For the spices, some cumin, turmeric and smoked paprika along with a bay leaf bring cozy savory undertones to the soup. Fresh parsley and lemon brighten up the flavors right before serving. All you need is some crusty bread to go with a bowl and you’ve got a healthy vegetable packed, high-fiber meal with a good amount of protein too. How Do You Make This Lentil Vegetable Soup Recipe? This recipe for lentil and vegetable soup is made entirely in the Instant Pot or pressure cooker so it’s an easy one-pot meal! 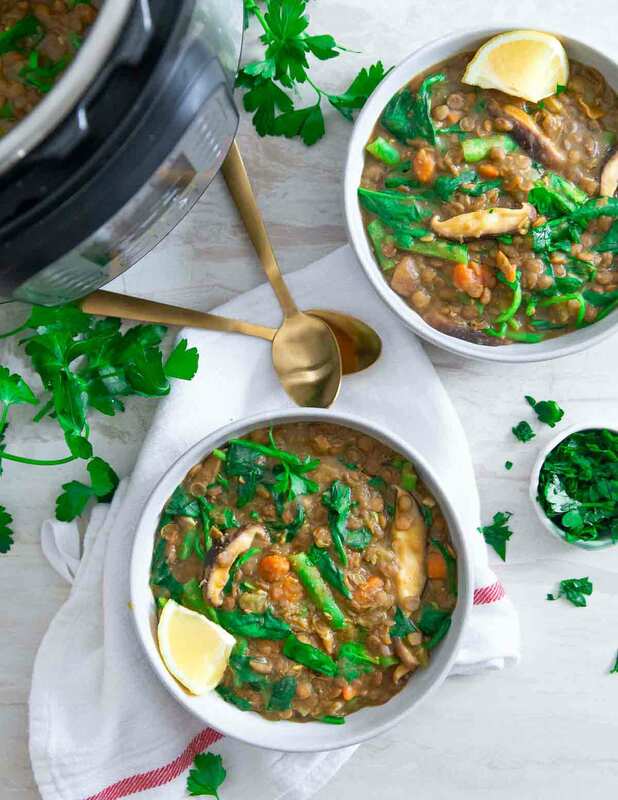 One of the reasons the Instant Pot is so great is that it allows you to utilize multiple cooking methods all in one and this lentil soup recipe takes advantage of that with a few different steps to prepare the soup. The first step is to use the sauté mode and cook the carrots, onions, celery and garlic. The spices get added during this step as well. Sautéing the ingredients helps develop the flavors more deeply for a tastier soup. Next, we add the lentils and broth and use the “soup” mode on the Instant Pot to pressure cook the soup for 15 minutes. The vegetables get added after the soup has pressure cooked using the sauté mode again which cooks them but also keeps them crisp and not mushy. Had we pressure cooked the vegetables with the lentils, you’d likely end up with a bowl of mush and nobody like mushy vegetables! The recipe calls for brown or green lentils because unlike red lentils, these varieties are a bit tougher and hold up much better to pressure cooking. Red lentils are great in quick soups but brown or green or more suited for this kind of recipe. I know some of you without pressure cookers are going to ask this so the answer is yes, you can! Let’s run through it. Sautéing the carrots, onions, celery and garlic and then adding the spices would be the same on the stovetop as in the directions for the Instant Pot. Once you add the lentils and the broth, reduce the heat to a low-simmer on the stove-top and cook until the lentils are tender with the lid on. This will probably take at least 30 minutes and you might have to use more broth than the 4 cups specified in the recipe if the lentils are absorbing it all. 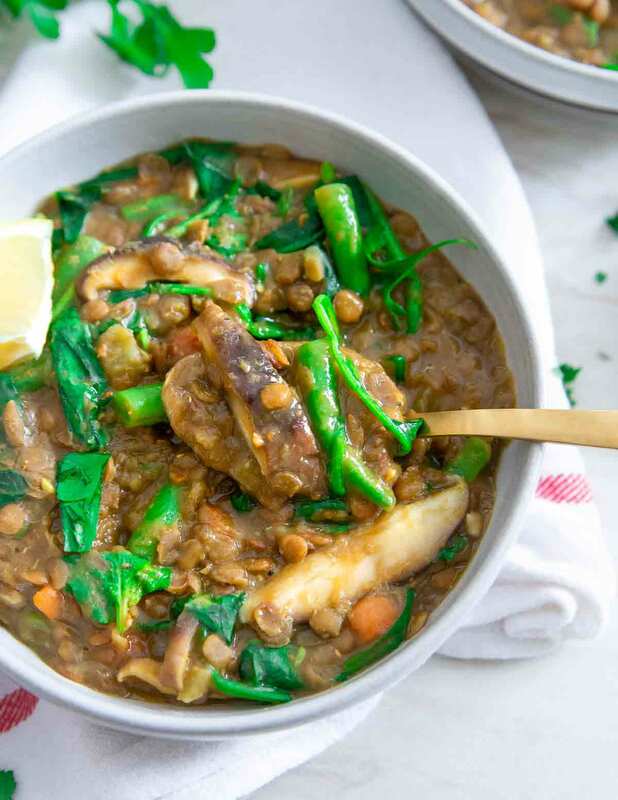 Add the vegetables once the lentils are cooked – green beans and mushrooms first then spinach right at the end. You can see the method is not much different for making this soup on the stovetop, it’s just going to take a little more time. This is really a simple lentil vegetable soup. There’s nothing complicated or fancy. A standard mirepoix base, a few “normal” vegetables and lentils. No weird ingredients, just the basics coming together for a really flavorful and easy meal. I love how lentils bring such heartiness to a meal despite their unassuming and humble appearance. Not to mention they’ve got a great nutrient packed profile too! Lentils are a great source of plant-based protein, high in fiber and iron among many other health benefits. You can also try this Moroccan lamb lentil stew or this lentil bolognese recipe for more ways to enjoy them. Love this simple lentil vegetable soup recipe? Try this Instant Pot Creamy Tomato Tortellini Soup for another great Instant Pot soup recipe or, make this Spicy Chicken Lime Soup on the stovetop, it’s a personal favorite, especially when fighting off a cold! If you’re looking for more recipes with lentils, try this Red curry vegetable lentils recipe, it’s great served over some rice. Or, this Turmeric Lentil Stew and reap all the great health benefits of turmeric. Turn Instant Pot to sauté mode and add olive oil to the inner pot. Once hot, add onions, celery, carrot and garlic. Cook for 2-3 minutes until softened, stirring frequently so the garlic doesn't burn. Add salt, pepper, cumin, smoked paprika, turmeric and bay leaf and cook for 1 minute until fragrant. Turn the Instant Pot off, add the lentils and broth and stir everything until combined. Place the lid on the Instant Pot, set the lever to the "sealing" position. Press "soup" mode and set for 15 minutes. Once done cooking, you can quick release pressure (by manually flipping switch to "venting") or let Instant Pot naturally release the pressure. Once pressure is released, remove the lid and press the "sauté" button. Add green beans and mushrooms and cook, stirring frequently for 3-5 minutes until vegetables have softened. Turn the Instant Pot off, add the spinach and stir until wilted. Squeeze the lemon into the soup, stir and serve. *If you have both fresh and ground turmeric on hand, feel free to use both in the recipe. 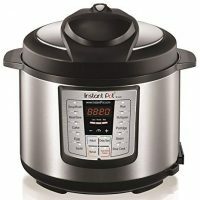 ***Cook time does not include time for Instant Pot to come to pressure or release pressure (if not using quick release method) as this will vary. Allow at least 10-15 minutes extra for that process. So much flavor and texture in this soup…everyone loved it! Thanks for the recipe. This is such a hearty and healthy meal! I love that I can make it so easily in my in my instant pot.